The Paviljoen is just right for get-togethers. At the same time, it is a centre where cross-pollination takes place between science and culture, the business world and research. Students, staff and EUR academics may not just visit the building and its events, but also organise events of their own in it. A wide range of events will be taking place in the Erasmus Paviljoen: lectures, debates, conferences and business events, but also film and performance – whether musical, theatrical or dance. Exhibits and presentations, drinks and parties: nearly anything will go! Check out the programme for an overview! The Erasmus Paviljoen is situated in the middle of the new and vibrant campus heart and is open to anyone: faculty and students’ associations, university or cultural organisations, theatre companies, bands and so on can stage their activities, performances and acts in the multi-purpose hall for their own audience. Students and staff can study or work in the lounge or hold meetings in the meeting rooms; and anyone is welcome to come for a bite to eat or a drink in the grand café or on the terrace. The wifi connection is excellent throughout the building, interactive screens keep everyone informed and our exhibition walls communicate the weekly specials, upcoming events and news. The menu offers substantial dishes at an affordable price as well as more exclusive dishes for the gourmet. And whether it’s a coffee on the go you’re after or a quiet breather in our lounge, anything is possible in the Paviljoen. The Erasmus Paviljoen has been built in the new heart of Woudestein campus, Erasmus University Rotterdam. Designed by Powerhouse Company and De Zwarte Hond, it plays an essential role in focusing and charging the newly created public space, both functionally and symbolically. Situated at the junction of the 2 main axes and universally oriented, the building provides a focal point to the campus – there where research meets business and academia mingles with culture. From anywhere in the Paviljoen there is a view on the campus, due to the glass façades and the differences in level inside the building. The Paviljoen’s design is an integrated approach, based on programming as well as intimacy, flexibility, sustainability and architecture. This has resulted in a building which not only adapts to daily changes in weather or of seasons, but also to the events it hosts. The building’s façade mediates between the exterior and interior, consisting as it does of louvered shutters. These open or close depending on the amount of sunlight, thus creating dynamic insulation and a façade which literally adjusts to weather and light. An energy-efficient feature. The organisation of Erasmus Paviljoen strives for sustainable working methods that are beneficial to people, animal welfare and the environment. This we demonstrate in a variety of ways. The flexible louvered shutters on the façade control the influx of heat and light, depending on the weather, the incidence of light and the seasons. In addition, we have natural ventilation, hot/cold storage and solar panels on the roof. The Erasmus Paviljoen is connected to a mono source for hot/cold storage, which stores energy underground in pipes of about 175 metres in length. Also, the Erasmus Paviljoen utilizes waterless urinals. Apart from our energy supply, the products and furniture used in the Paviljoen are also sustainable. Wherever possible, we serve organic and local produce, all freshly prepared in our own kitchen. Our coffee is fairtrade, the coffee cups biodegradable and our furniture partly vintage. Perhaps you’ve got ideas to make the Paviljoen even greener and more sustainable? 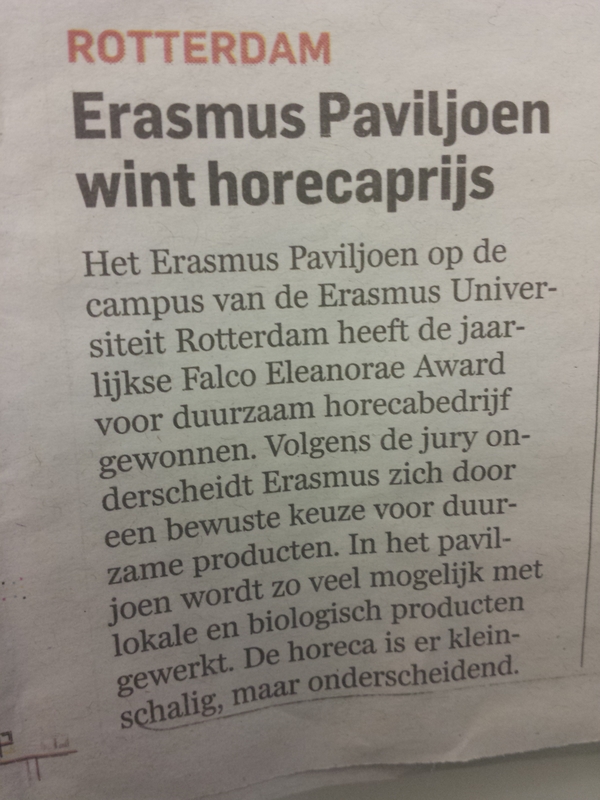 Mail them to info@erasmuspaviljoen.nl. We’re always open to suggestions! We are looking for someone to complete our amazing bar team. Do you want to work in the vibrant heart of the Erasmus campus? Do you have hospitality experience and can you stay a year or longer? We are looking for students who can work 2 shifts a week and someone who can work 4 shifts a week. We are offering a really nice and flexible job with different activities (hospitality, passhift, eventshift) so no day is the same. You will be working in the vibrant heart of the campus with a young, amazing and international team. As chef de partie you will help with mise en place, prepare your partie and run it. We have an international menu, with biological and local products. The menu changes every week, so you can really be creative. Flexible hours: From 7:00 till 15:00 or from 14:00 till 22:00. We are (almost always) closed in the weekends. The Erasmus Paviljoen has a board of the foundation and a team of employees. www.erasmuspaviljoen.nl is a publication of Stichting Erasmus Studentenpaviljoen. This website has been designed by Tangerine Design and is realised by Presta. Texts & (photo) editing: Stichting Erasmus Studentenpaviljoen.